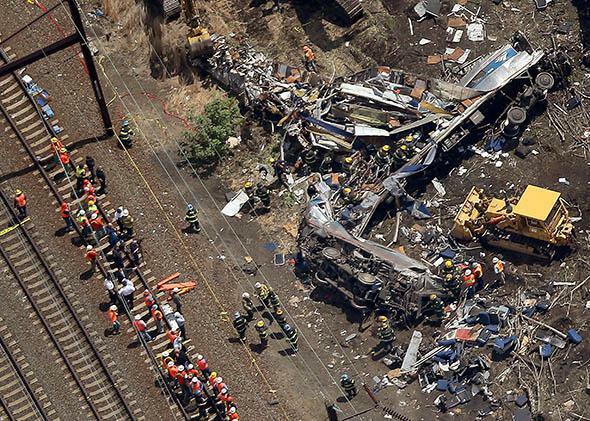 Amtrak train derailment, Positive Train Control, and wireless spectrum policy. What bad wireless spectrum policy has to do with the recent, deadly train derailment. Investigators and first responders work near the wreckage of an Amtrak passenger train that derailed on May 13, 2015 in Philadelphia. This piece originally appeared in New America’s Weekly Wonk. The precise cause of last week’s tragic Amtrak derailment, which killed eight people and shut down train service along the busy Northeast Corridor, remains a mystery. Whatever the cause, the crash revealed some fundamental gaps in Amtrak’s safety system—most notably the failure to deploy Positive Train Control, or PTC, technology that would have automatically slowed or stopped the train once it exceeded the speed limit ahead of the curve where it jack-knifed off the rails. Although Congress mandated PTC technology seven years ago, Amtrak cited a lack of timely access to wireless spectrum (the public airwaves) for delays in implementing the safety system. Spectrum refers to the wireless frequencies that power technologies ranging from FM radio and satellite communication to mobile phones and Wi-Fi routers. While increasingly critical to modern communications, spectrum—and the rules that govern access to spectrum in the United States—rarely make headline news. But following the Amtrak derailment, people are suddenly conscious of the fact that the nation’s policies on access to the airwaves will impact almost everything in their lives. So is Amtrak’s claim that spectrum access is a factor in this disaster legitimate? The answer is yes and no. Amtrak asked for exclusive, and expensive, spectrum, and this request—while puzzling—highlights deep structural problems with how our government has parceled out and regulated spectrum in the past. PTC relies on a series of track-side wireless beacons and onboard sensors to automatically issue warnings to train operators about excessive speed, potential collisions, or misaligned switches at intersections. To implement PTC effectively, Amtrak and other railroads needed to decide among a variety of ways to access the spectrum they needed to send wireless signals between trains and infrastructure along their tracks. In 2011, the railroad industry told the Federal Communications Commission that it needed exclusive access to a specific band of costly spectrum frequencies in order to deploy PTC. Because equipment was already being manufactured for this band, Amtrak and other railroads argued that a uniform allocation dedicated to PTC would reduce costs and promote interoperability. The particular band Amtrak requested—at 220 to 222 megahertz—is located just above TV Channel 13 and represents prime wireless real estate because of its ability to go long distances and penetrate into buildings. At next year’s auction of TV spectrum being vacated by broadcasters, mobile carriers like Verizon expect to pay at least $500 million for the equivalent of a single MHz of this scarce low-band spectrum. Tellingly, the 2008 legislation mandating PTC did not include language instructing the FCC to allocate exclusive spectrum licenses to railroads. The industry asked the FCC for a grant of spectrum, which it declined to do. Even if the industry’s request was good policy (and it wasn’t), current law requires that valuable commercial spectrum “must be acquired at auction or from third parties,” as the chief of the FCC’s Wireless Bureau explained in a recent blog post. Instead, the FCC told the industry that if it wanted exclusive use of this pricey spectrum along its tracks, it should negotiate private lease or purchase deals with existing license holders through secondary market brokers. While a consortium of freight-rail interests were able to navigate the notoriously illiquid secondary market for spectrum, Amtrak’s efforts were long delayed due to a lack of resources and other complications. Amtrak’s insistence on using expensive, exclusive-use spectrum reflected a traditional and ultimately unsustainable approach to spectrum policy. Since the government began issuing spectrum licenses to particular companies in the 1920s, representatives from each new industry would come, hat in hand, to the FCC to request its own special purpose spectrum allocation. At this point, almost every desirable frequency band has been assigned to someone, and because licenses typically renew automatically and equipment can last many years, it’s enormously difficult to find spectrum for new technologies and expanding uses like wireless broadband even though most bands are not used in every area or very intensively. The cumulative result of this command-and-control approach to allocation is that the nation’s spectrum remains extremely siloed. Thankfully, policymakers in Washington are moving away from exclusive licenses toward a new framework based on flexible use and shared access to spectrum bands. Amtrak and other entities with very specific needs for wireless connectivity will increasingly have better, faster, and more affordable options as the FCC expands on its recent efforts to open large, underutilized bands for shared use. Spectrum sharing is not a new idea. Indeed, it led to the development of one of the most important economically valuable wireless technologies: Wi-Fi. Wi-Fi thrived because the FCC allocated wide blocks of spectrum for “unlicensed” use. This meant that any technology could use these frequencies, provided they operated at low power to avoid interference. Technology did not need an exclusive license. The flexible and shared approach led to innovation. Spectrum originally dismissed as “junk bands” and the home of modest technologies like garage door openers and cordless phones are now home to Wi-Fi, Bluetooth, and other unlicensed technologies central to fueling the growing universe of mobile devices. “Unlicensed” technology utilizing shared spectrum is common not just in consumer devices, but as a Harvard Law School study points out, it is increasingly the go-to means of wireless connectivity in a wide variety of industrial settings, including for critical health care and electric utility applications. A majority of wireless health care devices, including patient monitoring systems, use unlicensed spectrum. Wireless smart grid and automated meter systems deployed by electric utilities also rely primarily on unlicensed shared spectrum. To address the scarcity of licensed spectrum, over the past three years the FCC and Obama administration have worked in tandem to open underutilized military and other federal agency bands for spectrum sharing as well. For example, the U.S. Navy controls a very large and nearly exclusive spectrum assignment for shipborne radar systems, which for decades has left that hugely valuable spectrum unused across the entire interior of the country. In 2012, the President’s Council of Advisors on Science and Technology proposed that this should be the first band opened for dynamic sharing by private sector devices and networks that can rely on spectrum sensing and a geolocation database—a “Spectrum Access System”—to operate on the band while simultaneously protecting naval radar and a handful of satellite receiver sites from harmful interference. To its credit, last month the FCC unanimously voted to create a new Citizens Broadband Radio Service, or CBRS, that promises to provide the framework for what the PCAST proposed could be a “shared spectrum superhighway” spanning more than 1,000 MHz of underutilized spectrum. On a portion of the new shared band, companies can pay for “priority access licenses,” which ensure quality of service over far smaller areas than are sold at traditional FCC auctions. And across the rest of the band—including the licensed portion when it’s not in use—any individual or company can operate on an essentially unlicensed basis, very much as Wi-Fi operates on today’s unlicensed bands. Spectrum sharing approaches like the new CBRS can address the needs of Amtrak and potentially thousands of other needs for specific wireless connectivity. Rather than rely on pricey auctions or secondary markets for a single channel of exclusive-use spectrum, railroads and many other industries can design systems that can operate on multiple, redundant networks and bands. In Amtrak’s case, the fiber optic cable running along the railroad right-of-ways makes shared spectrum bands more practical and reliable. With immediate access to a high-capacity fiber connection throughout its system, Amtrak and most other rail operators can rely on the open access and low-power shared spectrum—such as the unlicensed and 3.5 GHz Citizens Broadband Radio Service bands—that are increasingly plentiful. Although there is no way to undo the tragedy of the derailed Amtrak commuter train north of Philadelphia, more updated and forward-looking approaches to wireless connectivity and spectrum acquisition should be among the lessons learned by policymakers both inside and beyond government. As we move headlong into a world where virtually every system and device is connected and communicating, the stakes involved in getting spectrum policy right will only increase. This article is part of Future Tense, a collaboration among Arizona State University, New America, and Slate. Future Tense explores the ways emerging technologies affect society, policy, and culture. To read more, visit the Future Tense blog and the Future Tense home page. You can also follow us on Twitter.